Breakthrough Listen, the global initiative to seek signs of intelligent life in the universe – announced at the International Astronautical Congress the commencement of a major new program with the MeerKAT telescope in partnership with the South African Radio Astronomy Observatory (SARAO). Breakthrough Listen’s MeerKAT survey will examine a million individual stars – 1,000 times the number of targets in any previous search – in the quietest part of the radio spectrum, monitoring for signs of extraterrestrial technology. With the addition of MeerKAT’s observations to its existing surveys, Listen will operate 24 hours a day, seven days a week, in parallel with other surveys. 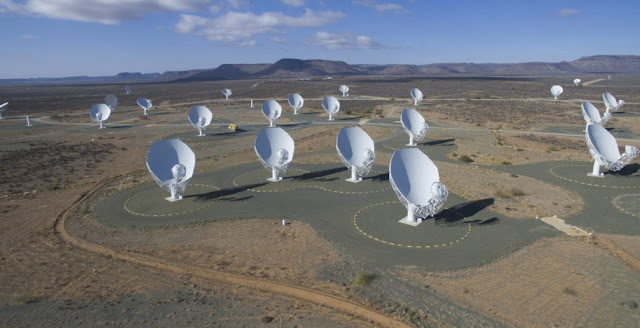 Built and operated by the South African Radio Astronomy Observatory (SARAO), and inaugurated in July 2018, MeerKAT is a powerful array of 64 radio antennas in the remote Karoo Desert of South Africa. By partnering with SARAO, Breakthrough Listen gains access to one of the world's premier observing facilities at radio wavelengths. Signals from the 64 dishes (each 13.5 meters in diameter) are combined electronically to yield an impressive combination of sensitivity, resolution and field of view on the sky. MeerKAT also serves as a precursor for the Square Kilometre Array, which will expand and enhance the current facility in the coming decades, eventually spanning a million square meters across South Africa and Australia to create by far the world’s largest radio telescope. Breakthrough Listen's involvement adds the capability to search for technosignatures – signals that indicate the presence of technology on an alien world, and hence provide evidence that intelligent life exists elsewhere. MeerKAT was constructed in pursuit of a number of key science goals, from surveying distant galaxies, studying explosive events such as supernovae and mapping the distribution of hydrogen gas in the early Universe. As at other facilities undertaking Listen's radio search, the new capabilities have been enabled by the latest digital instrumentation installed by scientists and engineers from the University of California, Berkeley SETI Research Center (BSRC). Unlike the case with the Green Bank and Parkes telescopes, however, the Breakthrough Listen team will rarely use MeerKAT as its sole observer. Rather, observations will occur in a commensal mode – at the same time as other astrophysics programs. Using sophisticated processing, Breakthrough Listen scientists will digitally point the telescope at targets of interest. This means that the Breakthrough Listen instrument at MeerKAT will be operating almost continuously, scanning the skies for signs of intelligent life. "With this new instrument we'll be able to form many beams at the same time, obtaining high resolution data for multiple objects simultaneously" said Listen’sPrincipal Investigator Dr. Andrew Siemion. "This complements and extends our capabilities at other telescopes, enabling us to survey our cosmic neighborhood for technosignatures faster than ever before." "Our new system is a small supercomputer," explained Dr. Griffin Foster, Project Scientist for Breakthrough Listen on MeerKAT. “The powerful Breakthrough Listenhardware will enable us to look for interesting signals in real time and save the relevant data products to our on-site data archive." The Breakthrough Listen system on the MeerKAT telescope will have a total input data rate of about 4 terabits per second (4000 gigabits per second), which is about 40 thousand times faster than a typical home internet connection. Prof. Michael Garrett, Director of the Jodrell Bank Centre for Astrophysics (JBCA) in the United Kingdom (a Breakthrough Listen partner facility) and a co-investigator on Breakthrough’s MeerKAT Program, remarked, "This development represents a step-change for SETI research. Employing a large distributed array of hugely sensitive radio telescopes like MeerKAT is really a no-brainer, offering many advantages over large single dish surveys. The Breakthrough Listen MeerKAT project can be a powerful new tool for SETI with the potential to completely transform the field."